Katie rejoined StreetSquash in 2018. Katie graduated from Vassar College in 2006 with a BA in Africana Studies and Political Science, and went on to earn a Masters in Education from Brooklyn College in 2008 through the NYC Teaching Fellows. 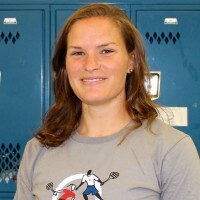 After two years teaching elementary school in Brooklyn, Katie came to StreetSquash and worked as a Squash Director until 2011, when she moved to Minnesota to serve as the Executive Director of Beyond Walls: Urban Squash Twin Cities. In 2014 Katie moved to Connecticut and spent a year as the Director of Family Advocacy at Stamford Academy, an alternative high school. Before finding her way back to StreetSquash, Katie worked with the Squash and Education Alliance, StreetSquash’s parent organization.